The story told by Three Pathways to Get Anywhere (Except When There is a Dead End) begins on a two-page spread that is entirely black but for three lines of text and four photographs. The photos depict the spreading dazzle of lights in the night, as if they are frames cut from a video recording of an approaching car on a dark road. The lines of text repeat the myth that when high-speed rail was invented “the first passengers worried their hearts would stop”. 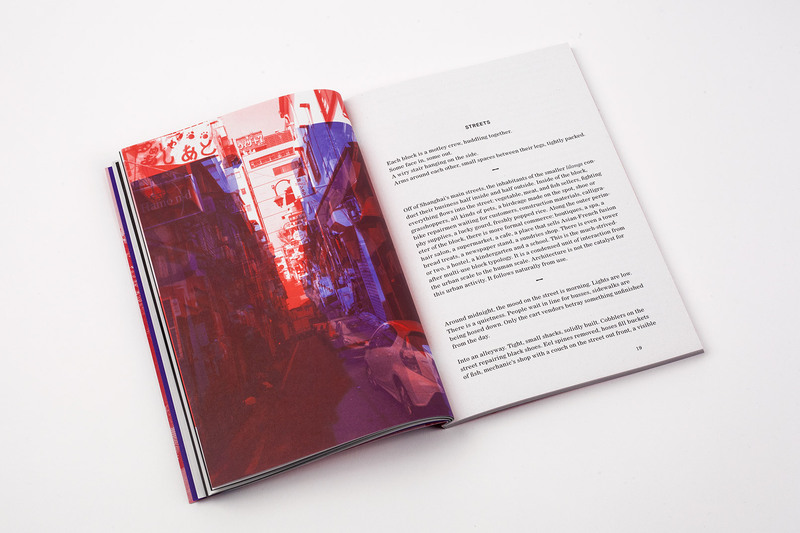 The next page opens to the book’s default form — white pages with one or two blue or red risograph prints, overlaid by the author’s notes and poems. The dynamism established at the text’s beginning is swapped for the impression and detail of location. This immediate switch in tempo slows the reader, going some way in mimicking the journey of the traveller: the hard bump and screech of a jet hitting the tarmac followed by a winding taxi ride from the airport to the hotel. It’s clear from here that this text is an unusual one. Three Pathways to Get Anywhere (Except When There is a Dead End) is a work of experimental nonfiction. The book is a collaborative effort, acknowledging and even crediting the work of the phantoms who are typically hidden in the shadows behind the published work. The words and photographs are by Anna Kostreva, an American architect, artist and researcher, cut from the journal she kept as she travelled through Beijing, Shanghai, Singapore, Tokyo and Kyoto. 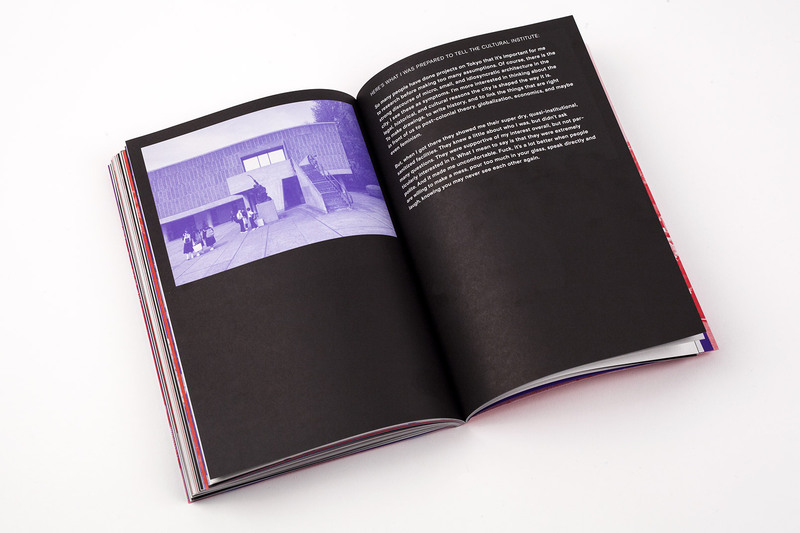 The text is collated in collaboration with Joey Horan of the book’s publisher, Rough Beast, and it is designed by YUKIKO Studio, the design agency behind the award-winning Flaneur Magazine. This sort of teamwork is to be encouraged — its outright acknowledgement is refreshing, and the results are, here, immediately discernible. Most striking, initially, is the book’s design. The images, often full-bleeds that form a backdrop to the text, create the fluidity of memory with their ghostly transparency, despite or maybe because of the reds and blues. They compliment the words on the page instead of dominating them, and are occasionally the book’s most captivating element. Kostreva’s writing reads like a mix of research notes and entries lifted from a travel journal. These notes have an evanescent quality, arriving sometimes as brief poems or single sentences, other times as narrative, but most often as mere impression: “Architecture is not the catalyst for this urban activity”; “Around midnight, the mood on the street is morning”; “We are happy to be in the presence of ancient trees.” This is the experiment here — not to follow a chronology or logical form but to gather the scraps of inspiration and recognition and wonder, and, in this act, attempt to capture the transient. That is, to reflect the fragmentary, disorderly way that the human mind processes the world, instant after instant. This has a clear precedence; the attempt to capture or reflect the unfiltered experience of the “real” in art is, from this vantage point, a modernist conceit. In What Ever Happened to Modernism?, novelist and critic Gabriel Josipovici writes: “What is at issue is reality itself.” This raises an important question: is the use of a literary mode that was problematised at least a century ago—and in use for even longer — still an experiment? In his essay, ‘The Magnet has a Soul & Everything is Water’, Darran Anderson helps to frame an answer: “Modernism didn’t disappear because it never definitively appeared.” Modernist techniques have been appropriated and absorbed into writing practice, approaches that have been pushed to the edges of what is commercially viable, yes, but that are ultimately still with us as tools at the writer’s disposal. Of course, although we have moved on from modernism proper, the desire to pin the chaos of experience to a page never left us. At the heart of the impulse is crisis — Anderson, again: “Every generation is reenacting the Great Disillusionment.” The reader of Three Pathways has the feeling of being stuffed into a suitcase, then pulled out to be shown an odd evocative sight here and there, and being whispered secrets in between. Maybe behind these secrets is Kostreva’s hidden fear that the world she set out for is not the world that greets her — these are her ripples of disillusionment. In its fragmented presentation, Three Pathways plays with existing ideas of experimentation, but such an experiment must put more at risk. This wouldn’t necessarily be a failing at all if it weren’t for the way it facilitates Kostreva’s treatment of the cities she visits and cultures she observes. This is a book about visiting East Asia’s political and economic hubs. Rather than view each of the cities as distinct phenomena, they are regularly merged, as if one. For instance, the section titled ‘Others far from home’ pulls together her experiences with expats. In this section, the narrative jumps from Tokyo to Beijing to Shanghai and back to Tokyo without any real signposting to mark these leaps. Later in the text, one page is dedicated to shots of Tokyo while its opposite page is a discussion of Shanghai. On another page, a paragraph of Tokyo transitions to a paragraph on Shanghai. Very often it is difficult to tell where Kostreva is writing from altogether. Yanfing lives in a tower with her family and works in the next one over. She says she doesn’t leave this corner of Beijing very often. Koolhaas’s CCTV building is close but not visible from her place. She was very happy that I visited her, like I was a messenger from the outside world. This behaviour reduces the text to a travel journal, a Moleskine cut up and coloured in with highlighter. This description undermines the work of the design team, but it is useful in illustrating the content and rendering the text’s claim to be experimental as a misguided one. In a poem entitled ‘Identity Balance’, of the project, and her tour through the five cities, Kostreva writes, “They give context to each other, and / it feels wrong to speak about them / in isolation.” There is clearly an awareness of this forced coalescence, then, but the failure to engage with the cultures instead of commenting from the outside looking in devalues the text. This is a lazy kind of cultural analysis. The reader that who has visited these cities will recognise the sights Kostreva singles out: the Beijing smog; the sobering up that daylight forces on Harujuku; Japanese train conductors bowing as they enter then leave the cabin; morning Tai Chi (and dancing and badminton and singing) in Beijing parks; Singapore’s incongruous yet charming mix of the tropical and colonial. Are these alone worth visiting a city for? Are these alone worth shaping a book around? By building her text in this way, Kostreva inadvertently goes to some length in demonstrating the limitations of the tourist trail. From this perspective, this isn’t the city. This isn’t the culture. This isn’t a people. This isn’t a lifting away of the layers of history. The visitor’s view is a limited one, the tourist’s even more so. In a lesson for all travellers: the tourist is not in a position to judge. Kostreva avoids judgements outright; these are her observations, sometimes considered, sometimes superficial — this is Kostreva looking at architecture in China or Singapore or Japan. But her judgements of these cultures are cast by making the decision to cluster five distinct cities from three distinct countries together in the method of the travel agent creating a holiday package deal. Rather than cutting through the confusion of place, the decision to put them in a sack and shake — the book’s primary attempt at experimentation — adds to it. Denying the impulse to completely decouple the cities is very nearly fatal to the text. The book’s clearest failing is that Kostreva’s strengths are architectural and not anthropological, but it is her writing on the latter that makes up the majority of the text, manifesting as the fleeting, ill-considered observations of a holiday-maker on the sightseeing route. In contrast to this, the section titled ‘Devotional Gods of Learning and Creation’ succeeds because it draws on inspiration from its surroundings while, paradoxically, forgetting where it is entirely. 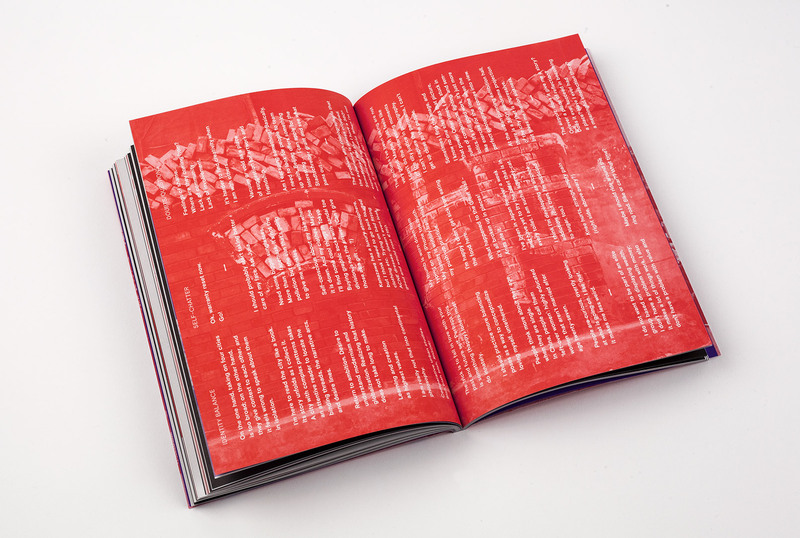 It consists of a two-page spread, one page black, the other white, with overlapping red and blue risograph prints of ambiguous photographs as well as a poem listing characteristics and matching them with Kostreva’s friends and family. She writes: “Of memory (dad) / Of obscurity (Peter)”. The mysterious, personal nature of this prayer for loved ones, the transition from white to blue to red which, overlaid, makes a colour entirely uncertain of itself, and then finally to black on the next page, fashions something surprising and singular. It becomes clear, then, that when the design elements are scissored out, too often missing from Three Pathways is the shock of the new. This hurts the text in two ways: firstly, it leaves the reader with a superficial view of these cities that limits any richness and difference that they have to offer; and, secondly, it curtails the book’s aspirations to escape orthodoxy. As Barthes observed: “To be modern is to know that which is not possible anymore.” Kostreva goes looking for the new, both figuratively and literally, yet struggles to find it. It’s a problem created by the global free market, yes — but also the writer herself. The layering of walls, like those in the Forbidden City, signifies movement, and it leads one to a sensed but unseen panoramic experience of being. By passing through walls, one traverses knowledge in time, rather than holding it as something separate from movement, temporality, and experience. Kostreva is also successful when she combines her interests, like when the architectural is melded with the personal for the sake of humour: “What happened to the Great Wall — / it’s all broken up in pieces! / Anna ate it.” Or intimacy: “Going up the mountain, I’m nervous about running out of time.” Or when it is evocative: “Balancing on one foot, / alone in a dark tunnel of orange Torii, / lamplight striped shows across the path.” But too often the subjects are split altogether and Kostreva’s attention strays too far from the subjects she knows best. So, what are Kostreva and Rough Beast concerned with — what are they trying to do? To make a stylish and unusual thing. They get close — Three Pathways is pretty, it is different. It nudges at the idea of book-as-object without ever quite taking it that far. This method makes little of much — arguably, of the 45 million square kilometres of the continent of Asia. Near the end of the book, in modernist fashion, comes epiphanic moments. Kostreva writes: “But every building has mistakes. I only see them now that I’ve made some mistakes myself.” This is followed by a flurry of discussion of local architecture. It’s the strongest part of the book. “I am trying to create an understanding of time, materiality, history, and culture.” With this sudden bloom of inquisition and thought, it finally becomes clear that, with this book, Kostreva and Rough Beast are indeed attempting to produce something more profound than what they ultimately end up with. And, now that this building is built, a monument of true collaboration, they will hopefully improve upon their successes as well as recognise their mistakes, and create something even better next time. Tristan Foster is a writer from Sydney, Australia. He is an editor at 3:AM Magazine. Posted in Book reviews and tagged Anna Kostreva, East Asia, experimental, Joey Horan, travel observations. Bookmark the permalink.